HMS Coventry was a Type 42 (Sheffield Class) destroyer of the Royal Navy. She was launched in 1973 and accepted into service on 20 October 1978. She was one of the Batch 1 ships. In order to cut down costs she was 47 feet shorter at the bow and thus she performed poorly at sea trials (batch 3 returned to the original designed length and performed much better). Main mission for this type of destroyer was mid-range anti-aircraft defense for which it was armed with Sea Dart missiles (designed in the ‘60s). Secondary mission was anti-submarine (3 torpedo launchers on each band) and anti-shipping (with a 4.5 in gun). For close defense it only had a couple of WWII vintage 20 mm guns (one on each side close to the bridge). Her first mayor deployment was in 1980 to the Far East where they did an official visit to China and on their way back she patrolled the Persian Gulf for 6 weeks following the start of the war between Iran and Irak. In 1982 HMS Coventry was taking part in Operation Springtrain ’82 along with most of the British fleet in the Gibraltar area when, towards the end of March, information started to arrive that meant that something big was afoot. The Royal Navy was aware of the movements of the Argentine Armed Forces and was expecting an operation against the Malvinas/Falklands Islands. Mission of the three Type 42 destroyers was to provide forward long range air defense. As such they were position further west than the rest of the fleet. On May 2nd ARA General Belgrano was sunk by HMS Conqueror with the loss of 322 sailors outside the exclusion zone declared by the British and while sailing away from the Task Force. News of the sinking reached HMS Coventry but no cheers was felt by the sailors…they knew that this was war, they could be next and also feel a great brotherhood with all sailors regardless of their country. May 4th found HMS Coventry, Glasgow and Sheffield (from North to South) in their battle stations and ahead of the Task Force. Argentine Navy Trackers had found the British and their radar emissions had been detected thus raising the alarm and getting the defenses on edge. While HMS Glasgow was sure an incoming raid was taking place it seems that HMS Sheffield was not and HMS Invincible even tried to calm down the defenses claiming that it was a false alarm. Nevertheless Glasgow and Coventry were on high alert and it not surprising that the only the three D-42 that had not fired chaff as a precautionary measure was hit by an AM39 Exocet fired by one of the incoming Super Etendards. Even though the war head did not explode the fire lighted by the fuel of the missile took hold and some days later, while being towed in high seas, HMS Sheffield sunk. Twenty of her crew loss their life. On May 9th the Argentine radar in Puerto Argentino/Port Stanley detected a couple of ships to the north of the islands. That is where HMS Coventry along with HMS Broadsword were placed (It was called a 64 Combo being made of a Type 42 destroyer for long range and a Type 22 Frigate for short range defense). In order to confirm the different conflicting pieces of information that observers and radars were passing to the information center, two missions with Lear Jets were sent. A pair of Harriers chased away the first one (Pico 1 and 2); the other evaded a couple of Sea Darts fired by HMS Coventry. These were Lear LR-35 flown by Mj. Gonzalez/Capt. Ceaglio and 1st Lt. Acosta/Alf. Redonda. Their calls sign was Pepe 1 and 2. When flying at 35,000 ft at 10:30 am Pepe 2 saw the streak of a missile. The section opened up and dove when they saw that it was actually 2 missiles flying horizontally. The Lear Jets were not impacted. At 11:45 another Lear Jet arrived in the area. It was called Litro 1 (Capt Argues/ Lt Cercedo/Lt Dominguez). While flying at 40,000 ft and in contact with the radar in Puerto Argentino/Stanley they were ordered to break as fast as possible. They turned right and the radar operator urged them to turn even faster and tighter. At that moment Lt. Dominguez saw a missile flying past the tip of their wing. They dove fast and managed to get Rio Gallegos. HMS Broadsword radar saw the missile and planes converging so claimed the planes shot down. Cheers erupted in HMS Coventry. The first kills of the Sea Dart were claimed…but later on it was found that it was not so (even though some British documentaries claim the contrary as late as 2007). It’s important to mention that according to the captain of HMS Coventry, it was originally believed that these missiles were fired to an Hercules escorted by Mirages, when in fact they had no visual and no way to verify this information or who they were firing at. As the Sea Darts confirmed the presence and approximate position of the British ships, the Argentine Air Force launched seven missions. The weather in that part of the islands was good, but the rest was covered in 8/8 clouds. One of those missions was OF 1174 made of four A4-C, call sign TRUENO. Each plane carried one British bomb of 1,000 lb and were led by Capt. Jorge Garcia, his wingmen being Lt Jorge Farias, Lt Jorge Casco, Ensign Gerardo Isaac. They took off from San Julian. When trying to refuel from the KC-130 tanker, Trueno 1 and 4 had problems so they turned back. Trueno 2 and 3 kept on flying, as their refueling was successful. Meanwhile, other missions were aborting due to the solid cloud cover that was not allowing them to see the surface of the sea. Now Casco took the lead, followed by Farias. They descended into the clouds, looking for their targets. In such conditions, they should have returned to base but they were too eager to press the attack. They flew under the clouds, into showers and fog. They asked for an update of the position of the ships (“Where are those d… ships!”) and they were answered that they were farther East. So they kept on going. But the problem is that they had descended too early and without knowing it, they were in the area of the Salvajes / South Jason Is. On top of this, the radar in the islands was not able to see them as they were still too far to the West, flying too low. No one heard or saw the planes ever again. When learning that 2 Skyhawks had been lost in the area on that date HMS Coventry’s captain Hart Dyke claimed them (assuming that the Sea Darts seen to merge on the targets had been the A4-Cs when in fact it had been the Lear Jets). In 1982, after the war ended, C-313 was found with the pilot still inside the cockpit. The plane had no trace of missile impact. In fact, the island and the cliff were between Casco and HMS Coventry. It is clear that with very bad visibility, Casco flew his plane into a cliff on the West side of South Jason / Sebaldes Island. Though Farias plane has not been positively found, there are indications that it might have crashed in shallow water to the southwest of Casco’s last position. Lt. Jorge Casco is now buried in the Argentine Cemetery in Darwin, Soledad/East Falkland. As Hobson stated in his book, though HMS Coventry and HMS Broadsword claim these two Skyhawks shot down, in fact the Sea Darts were fired at the high flying Learjets and the Truenos (Skyhawks) were still too low and to the West for the 42-22 combo to be able to “see” and engage them. Christopher Chant also confirms in his book that the planes were lost due to bad weather. Later on the same day the Argentine trawler Narwal was found and attacked by Sea Harriers (Lt. Morgan and Lt. Cdr Batt from 800 Sqn – HMS Hermes). This ship had an Argentine Navy member on board and they were shadowing the Task Force. The ship called for help as they had been hit and was sinking. The Air Force refused the request to send a helicopter to rescue the survivors as the presence of the Harriers deemed the operation very risky. The Army decided to send one of their SA-330-L Puma AE-505 with Lt. Fiorito, Buschiazzo and Sgt Dimotta. While 13 miles away from HMS Coventry the helo was hit by one Sea Dart fired by HMS Coventry. The target had been acquired by HMS Broadsword and the information passed to HMS Coventry’s system. The combo 64 was working. A tally with painted kills (3 by now!) was painted on one of the doors of the ship. May 12th left HMS Coventry as the only D-42 destroyer in the Task Force for the time being (Cardiff and Exeter being 1 week away). During the last daylight shelling of Stanley/Argentino HMS Glasgow and HMS Brillant came under attack two waves of Skyhawks. As a result Glasgow was left with a passing hole that forced the ship away from front line duties. For more details about this attack read this link. During Operation Sutton HMS Coventry and HMS Broadsword were placed to the North of San Carlos water in order to shot down incoming raids meant to attack the landing British Forces. Nothing was seen by the 64 combo until May 24th more missions were scheduled to attack the landing area. OF 1227 (PLATA) was made up of Capt Dellepiane in IAI Dagger C-434, 1st Lt. Musso (a former Dagger pilot who had volunteered in early April to return to the Air Force as he was by then a captain in Aerolineas Argentinas) in C-420 and 1st Lt. Callejo in C-421. PLATA section reached the target area flying north of Pebble Island (Borbon) and then reached the landing area. Musso said that he had to attack the small harbour in San Carlos and they were fired at with guns, missiles and everything that the British had at hand. He dropped his bombs on a ground target and he could see, flying so low, the British soldiers aiming at them with portable anti-aircraft missiles. He made several maneuvers to avoid the enemy fire and finally arrived to the sea. He thought: “OK, I am saved” but he realized he was flying to the EAST (towards Africa, as he remembers). Always skimming the waves, he turned to the continent and close to the Northern entrance of San Carlos waters he found 2 British ships: HMS Coventry and Broadsword. He started to think: “they will hit me, they will hit me” but he was not fired at. Some instants later and using the same escape route Callejo faced the British ships as well. He flew towards the islands to escape the “42-22 combo” and one of the ships fired a missile at him though the captain of HMS Coventry says that the planes were out of range and in his book does not mention firing a missile. Callejo immediately dropped his 3 empty 1,300 lt. tanks, turned sharply to the right and succeeded in evading the missile. The seconds it took him to get to the coast of the islands seemed ages. All the Daggers made it safely to their base albeit they were slightly damaged. For details about these attacks you can read this link. Capt. Hart-Dyke requested permission to move his ships further to the north, into open sea, in order to give their missiles a better chance of defending themselves. They knew that they had been spotted the day before and it was a matter of time before an attack was launched against them. During May 25th (Argentina’s National Day) several attacks to the beach head took place during the morning (even though discrediting British authors say that the pilots were too busy watching the soccer/football World Cup games). During two of these attacks Skyhawks were damaged by small arms fire, were losing fuel and climbed to try to save some during their return flight. Regretfully their path put them within reach of HMS Coventry’s Sea Darts. The first to be shot down was the Capt. Palaver (commander of the Squadron) in his A4-B Skyhawk C-244. The plane exploded taking his life. Several minutes later another Skyhawk attack took place on San Carlos. The leader (in this case the Squadron commander of the A4-Cs) Capt. Garcia reported having his hydraulics damaged and climbed to the north of Pebble/Borbon Island. He was hit by another Sea Dart (kill #3 of HMS Coventry) and ejected. His parachute was seen coming down by the British sailors but he was not rescued. He died of exposure and his body was found by two kids close to his dinghy on a beach on Pebble Island in 1983. Even though it was claimed that the Skyhawks were after HMS Coventry, truth is that they were damaged and were trying to return to their base. Finally a couple of sections were tasked with dealing with this menace. They were OF 1236 (VULCANO): C-225 was flown by the Capt. Pablo Carballo with Lt Rinke as his wingman (Ensg Carmona was forced to return due to mechanical problems) and OF 1237 (ZEUS): 1st Lt. Mariano Velazco (C-207), Ensg. J. Barrionuevo (C-212). Lt. Osses also returned with mechanical issues. Each section had their own route, so they were flying using different routes. Tactic for this type of attack had been practiced many time by the Argentines: fly close to the surface of the sea with the planes close to each other and the land as background. It was known that the multiple echoes on the radar and a confusing background would confuse the system forcing a shutdown to reset followed by a restart (thus the defenses would lose approximately 6 precious seconds). The attacking sections had been seen by Coventry’s type 909 radar while 180 miles away taking fuel from their tankers. Coventry and Broadsword knew that a raid was incoming. The now well-known shape of the islands started to show on their windshields when a thin layer of salt started to form on Carballo’s oval windshield. This had happened in previous missions but had been solved by 1st Lt (biochemist) Haggi, who found a solution to fix the problem. Carballo immediately remembered non-commissioned officer Escobar, a mechanic who had cleaned with all his love the windshield and who had asked Carballo if he was satisfied with his job. He had cleaned away the solution! The Skyhawk pilot considered returning to base because it was difficult to look forward and also now his gunsight was useless. Therefore he would have to calculate the point where to drop his bombs and decided to keep on going. Carballo soon discovered he was not going to be able to follow the initial route, as he would not be able to fly above land from Puerto Ruiseñor onwards, to Rasa Island (West of Borbon Is), due to his now restricted visibility. Hence he started to fly a little bit away from the original route. The British radars lost and regained their track many times because the planes were flying over land. But it was clear that there were 2 planes followed by another 2. There was a section of Sea Harriers (Morgan and Smith) being controlled by HMS Coventry and were available to try to take out the raiders. “Careful as there is Harrier CAP entering the Sound from the South!” It was Morgan and Smith chasing after the Skyhawks. Carballo acknowledged and understanding that he could get to my target before they could be intercepted, he decided to continue. Diving on the Skyahwks, Thomas was able to get visual while Dave was covering them, as all good wingmen do. At that moment, they were ordered to break by Hart Dyke as the ships were going to take on the incoming attackers. Frustrated, they turned away as they risked being shot down by their own side. They started the bomb run. Carballo felt very small attacking those two huge steel constructions that commenced their defensive fire the moment the Skyhawks entered the sea flying from Rasa Is, even though the planes were not in range. Their hits were at the beginning far ahead: water was dancing and jumping high and there were explosion in the air that formed a band that seemed to be alive. The ships were covered in smoke after each shot. Carballo thought they were in the middle of a sea battles movie. The wall of fire was very dense and both ships were firing with everything they had, and the salt on the windshield prevented Carballo from seeing how close their hits where. The windshield has 3 parts and he could only see thru the ones on the sides as the oval one (center) was covered in salt. “Which one do we attack, sir?” asked Rinke. “Let’s go to the one that’s behind, as it is less defended” Carballo answered. Both ships started to accelerate, with high lips of water on their bows. They were heading East with approx. 200 meters of distance between them. The tactic devised by the Argentines to confuse the missile systems worked. HMS Broadsword’s Sea Wolf system failed again, as it had happened on May 12th. This time, as the planes were flying so close, the system could not decide what target to shoot at first, so it turned itself off. It had to be reset manually, but the process takes some seconds, vital seconds that they did not have. Both ships were firing only with their guns and hand held armament given to their crew. No missile was fired at the Skyhawks. When Broadsword covered both sides of his blurred windshield, Capt. Carballo let his 1,000 lb bomb go, waiting a little more time than usual due to his bad forward vision. He remembers that Coventry was still firing at them on their right. “I don’t see anything!” It was 1st Lt Velasco who was arriving with his second section. “I was hit, I think I was hit because I have felt several hits underneath” (I had been hit by a small piece of shrapnel under his right wing). Velazco and Barrionuevo started their attack. This put her between the stopped ship and the attacking planes. Again 800 Sqn pair started to track the second wave of Argentine planes, but for a second time they were called off. This time Broadsword’s system were going to be fired on manual mode so there was no chance that the system was going to fail again. The Skyhawks were clearly in the center of the TV screen and locked in the radar of the Sea Wolf system. Ready to fire, the operator said: “You will die, b…!”. Now finally with her side against the planes HMS Coventry was giving everything she had. The 20 mm gun jammed. Everyone was firing with their hand held guns. Trev Trevarthen was ordered to blind the pilots with the signaling projector which he found useless so he did not carry out the order. The only thing that was left, as someone said, was to throw their watches at the planes! “Yes sir, you hit it perfectly, it was a CL42, I saw her clearly, I almost crashed against one of the domes, I saw your bombs hit the hull and in the other one, close to the water line, there was a column of smoke!” The 4 pilots started to shout at the same time while they were still being fired at, but the columns of water were quite behind. After a practically quite trip back, except for Carballo’s concern about his loss of fuel due to the slight damage to his plane (he even considered the option of ejecting in case he run out of fuel), they made it back to their base. HMS Coventry had been hit by 3 bombs on her port side one meter above the waterline. Silence followed the “thumps”. The one in the center failed to explode but nevertheless contributed to the posterior flooding (this was in the storage room). Another one entered below the bridge and spiraled down from deck 2 to deck 4, below the computer room and exploded killing everyone there almost immediately. The third bomb exploded as well, this time in the Forward Engine Room and killed everyone in the dining room, located above the FER. With fire on board and taking water, the ship started to list and the damaged caused by the bombs only helped the water to rise to the upper decks. Cannon hits from the 20 mm of the planes in the stern area contributed to the flooding. Sadly, 19 members of HMS Coventry lost their lives. The rest, some with terrible injuries and burns, made it safely to the boats. There was no order to abandon ship. It was clear that she was doomed. Some tried to take the Sea Lynx from the hangar and fly her away, but by the moment they were ready the ship had listed so much that it was impossible to make her take off (and thus she was lost with the ship). In 20 minutes HMS Coventry had turned over and shortly afterwards capsized. Shortly afterwards, choppers from San Carlos arrived to rescue the sailors. For details about the heroic deeds of the crew to save each other Capt. Hart Dyke’s book is excellent. Thomas and Smith returned to their carrier, “spitting nails”, completely angered and frustrated as they could have prevented the catastrophe had they been given permission to engage the incoming Skyhawks. In the meantime Broadsword limped away very slowly, her helicopter destroyed and with a fire on board that was controlled shortly afterwards. At the moment of her demise HMS Coventry was credited with 1 Puma, 4 Skyhawks and one Aviso (Somallera) and thus was believed to be the most successful anti-aircraft asset in the Task Force. As we have seen, her true kills were the 2 Skyhawks on the 25th and one Puma. The place thru which, as tradition says, the Skyhaws crossed Borbon/Pebble Is on their way to their target (in Pebble/Borbon) has now been called “Skyhawk gap”. Close by there is a cross erected to remember the lost ones on HMS Coventry. Frank Armes, John Caddy, Paul Callus, Stephen Dawson, John Dobson, Michael Fowler, Ian Hall, Rodney Heath, David Ozbirn, Glen Robinson-Moltke, Bernard Still, Geoffrey Stockewell, David Strickland. Adrian Sunderland, Stephen Tonkin, Ian Turnbull, Philip White, Ian Williams, Kyu Ben Kwo. After the war a team of divers removed sensitive information and parts from the ship, along with items belonging to Capt. Hart-Dyke, the bell of the ship and a cross of nails from the Coventry Cathedral. This item was passed to the next HMS Coventry in the Royal Navy (a class 22 frigate) until this one was decommissioned and then the nail was returned to the Cathedral. A preview of this kit can be found here. Basically the kit offers the options for two Argentinian D-42 (ARA Hercules or ARA Santisima Trinidad – she has just sunk while moored some weeks ago) and HMS Sheffield and HMS Coventry. Besides there are dozens of parts for other ships. Some parts are clearly oversized for the scale but in all you can find everything you need for these ships. 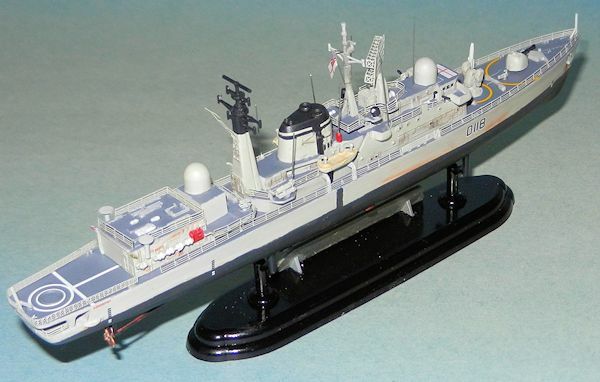 I built this very same kit many years ago as a present for a friend of mine (an officer in the Argentine Navy). Of course it represented ARA Hercules, the Navy’s flag ship. This was the standard Dragon version of the kit with no photoetched parts. But parts and decals were exactly the same. Basically I put together the two halves of the hull and the main deck. Union of the two halves (top and bottom) of the hull is not very good and required some putty. All the different decks were tackled next. I followed instructions for steps 8 and 9 but parts A2 and A15 did not seem to fit together. The length achieved was too long when these two structures were put one afterh the other. So something was fishy here and I decided to unglue it. It took me a couple of nights and lots of search for clear pictures to find out really where things go and how to attach them properly. The big square antenna, made of 3 photoetched parts, is much more convincing than the plastic one. Once I had all subparts completed during steps 8, 9 and 10 it was time to paint it. Here I realized that I had built deck over deck and now painting was going to be a nightmare. I decided to paint the sides of the ship first using MM Acryl 4765. Then I painted (following the instructions) the hull in a mix of red and brown. Then the nightmare began. It took me 2 to 3 nights to mask all the walls of all the decks and the hull in order to protect them and give the top surfaces a hand of MM Acryl 4754 (which is a tiny bit too dark). At the same time I also left unmasked the middle band on the hull (to be painted in black) and the black ID band that runs on the side of the ship (including the funnel). Having achieved the task without too many mishaps I got the model pretty much ready for final assembly. Per pictures of the ship some details were painted in red. All the sub builds were glued to the hull, including antennas and radars. Lifeboats were painted in white. Windows were highlighted using a black pencil. Sanded black pastel was drybrushed around the mast (A29) and in several areas to represent dirt and wear after weeks in the high seas. This effect was enhanced with rust color pastels. Landing lights on the helicopter hangar were painted red and green. The two launches were covered in tarpaulin in real life. To achieve this I placed the launches face down over aluminum foil, cut the foil around the edge of the launches and then glued it on top using cyano. Then the foil was painted in light beige. By pressing it against the surface of the plastic parts I achieved some realistic wrinkles. Sea Dart launcher was positioned with only the left missile left (the right hand side one had been fired at the second pair of Skyhawks). The 4.5 in gun is slightly moved to one side as seen in the pictures of the crippled ship. The stand for the kit (pieces C7 to C10) was painted in gloss black. Two pieces of lead were attached underneath to give it some weight as the complete structure would have been pretty unstable without them. The plate for the name of the ship (HMS Exeter is molded in the original part!) was sanded and painted in silver in preparation for the decals I made with the name of the ship.The support was glued to the hull and then protected by plastic film. The entire ship received a hand of Future and decaling could start. I first put all the decals on the main deck (the round and semicircle around the Sea dart and gun should be red and not yellow). They reacted very well to a combination of Set and Sol. The center of the round decal on the helicopter deck was cut out so I had not to deal with the uneven surface. Then I proceeded with all the decals on the hull. A piece of 0.010 stainless wire was vent, the flag (decal) was wrapped around it and then attached to the main mast. I printed HMS Coventry / May 25 1982 and the time of the attack in clear decal paper. The plate was given a thick coat of Future with a brush and later on the decal was carefully applied. A couple of days later everything was sealed with MM Acryl Matt Clear. Support for the antennas (painted in red) was made of the 2nd Sea Dart (not used). All antennas were made of 0.010 in stainless wire. The propellers were glued after being painted in bronze color. 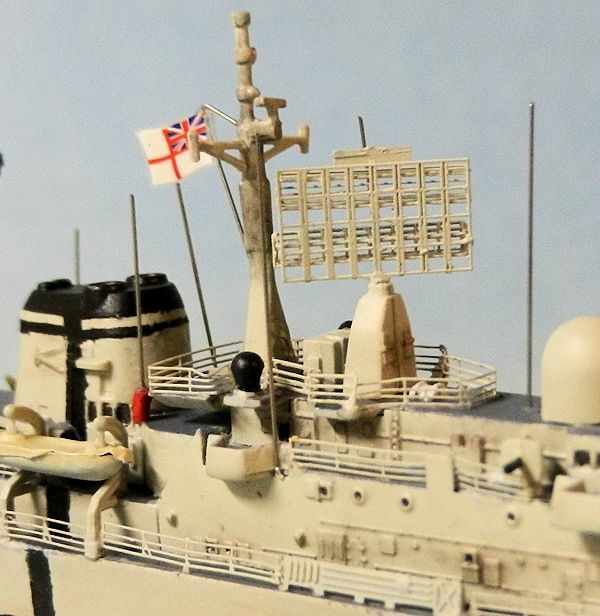 Note that the kit’s have 3 paddles but the ship’s actually had 5. Oh well…! At this point the ship was ready but for the photo etched hand rails. I pondered leaving them aside but the ship was calling out for them. So, not having experience with such long etched parts, I started with the area around the helicopter deck. It was not hard at all. It only required a firm hand, a couple of pliers and a Xacto knife. Cyano (gel) glue worked fantastic. In three sessions at night I cut and glued all the rails. Instructions on the kit are incomplete and a picture of a very nice large scale HMS Coventry model helped me to install the missing one. I was left with practically an entire part #1 (etched) not used. …and to my horror I found I had a picture of Coventry completely capsized and the color of the hood was not red (per kit instructions) but black! So I had the option of letting you know not to make the same mistake I did or correct it (to keep on being as accurate with the kits as I try to be with the historical section). ….so back to the working bench, cut a rectangle of white decal to size, glued it and got a very thin strip of red from an Aerocalcas decals set that fit perfectly…and that was it! Finito!! No more! Took the pictures for the 3rd time (!) 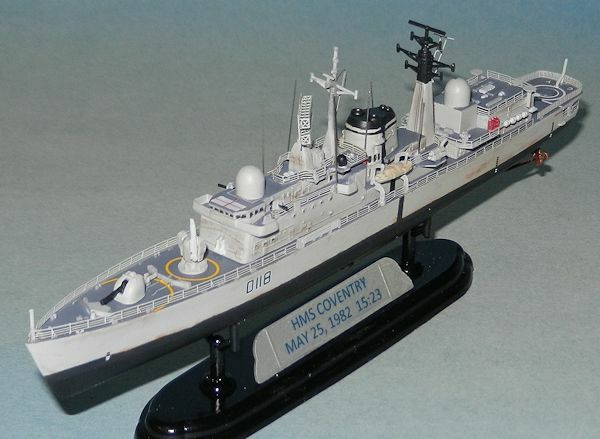 and here you are…the completed HMS Coventry instants before being hit by Mariano Velasco’s bombs. Thanks to www.dragonmodelsusa.com via your editor for the review kit.